Reserve Your Group Expedition Today! Join us on Scout Day for a day of scouting fun. Meet the experts on topics ranging from bugs to camping to lizards. 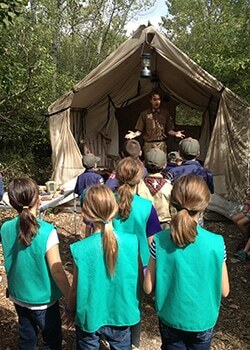 Try out hands-on activities that are applicable to Brownie & Girl Scout badges, Cub Scout belt loops & Boy Scout merit badges. Pick up a schedule of special events in Base Camp and get stamps as you complete activities. Participating scouts earn a commemorative patch! 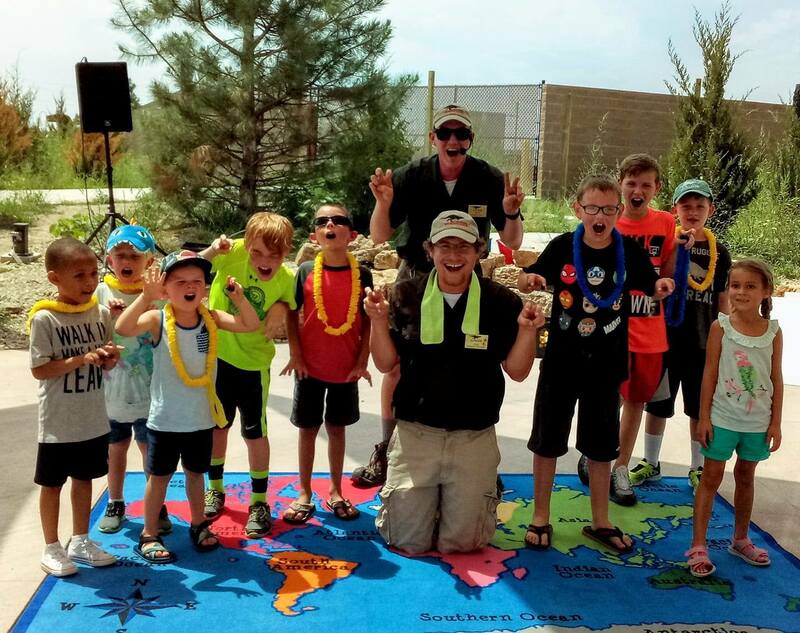 SCOUTS SAVE ON SCOUT DAY! Come with your troop or come with your family! Book your adventure in advance! Each Scout in uniform will earn a commemorative patch! Field Station: Dinosaurs is the perfect place for your corporate event, wedding reception and/or actual wedding. For your event, we will open the entire park with over 44 animatronic dinosaurs and you can plan for Jurassic Golf and the Challenge Dome as optional additions to your event. Gather your group in Base Camp for activities, whether it be an annual company update, slicing the wedding cake, or an exciting line dance. Roam the park at your leisure. The Field Station has an open catering policy and our vending partner, Shaken or Stirred, will supply beverages. Whatever your event, Field Station: Dinosaurs is ready to make it unique and special. Cost: $1500 for first 150 attendees. $10 per any additional attendee. Group discounts are available for groups of 20 or more. One complimentary chaperone ticket is offered for every 20 student tickets purchased. Additional chaperone tickets may be purchased at the applicable group rate. One chaperone required for every 10 children in the group. In order to avoid sales tax, proof of tax exemption is required (ex: ST-4 or 501(c)3 Letter). No tickets will be mailed. Parking is free at the Field Station. On school group days, buses will unload students in a designated area near the entrance gates of the Field Station and students will be greeted by Field Station staff. Buses will then be directed to park in the FSD parking lot. Your group numbers may be adjusted up to 48 hours prior to your trip. The confirmed number at 48 hours is the expected minimum payment. Payment in full is due prior to the tour on the day of your arrival. Field Station: Dinosaurs is open rain or shine. On rainy days, guests without appropriate rain gear will be provided with a free poncho and the activities will be moved to covered areas. If you notify us that your principal or other school administration will not allow your group to visit the park because of the rain, we will attempt to reschedule your trip. Rescheduling is subject to space availability. Field Station: Dinosaurs has a gift shop that is open on general public days and school group days. On public days: If you are bringing your lunches, please note Field Station: Dinosaurs is not responsible for lost or stolen food. If you bring your lunch in your own cooler, it must be left in the designated area in the Canteen. Lunch activities will be in Field Station’s Picnic Pavilion only. No food is allowed in the park. Students must be accompanied by a minimum of one adult for every ten students. Additional chaperones who arrive with the group will be charged the group rate upon entry and must join and remain with the group at all times. For the safety of the children on school group days, chaperones who do not arrive with the group and who are not included in the group numbers, will not be permitted to enter the park. Please call Group Sales at 855.833.3466 at least 48 hours before your trip to notify us of a change in plans. Date changes are based on availability. Field Station: Dinosaurs does not guarantee admission to school groups without a reservation. On school group days, schools may be turned away if field trip dates are changed without prior approval. Reserve your group event today by emailing ksgroups@fieldstationdinosaurs.com or calling 855.833.3466. We recommend reserving your birthday party as early as possible as time slots are limited and are reserved at a first come first serve basis. Birthday parties require a minimum of 10 people. This count may include adults and children. Children younger than 1 years old are not included in this count. Reservations require a non-refundable deposit of $100 at time of booking. Final attendance and a guest list must be confirmed 48 business hours in advance of your party with the Group Sales Department. Please email guest lists to ksgroups@fieldstationdinosaurs.com. Birthday parties may be rescheduled up to 24 business hours in advance of your party. Lunch Menus (Fossil Fete package only) and cupcake choices are due 5 days prior to your party. Because you have a designated time for party events, it is required that you and your guests arrive 30 minutes before the assigned party start time. Final payment and check-in must be made at the Box Office before your entry into the park. A credit card will be held at the box office until the end of your party. You are not permitted to decrease attendance at the Box Office on the day of your party. A $15 “No Show Fee” will be applied to each absent guest from your confirmed guest list. We are an outdoor exhibition. Party spaces are located in tented areas and are held rain or shine. On rainy days, all group members will be provided with a free poncho and the activities will be moved to covered areas. Outside food may be brought into the park only if you have booked the Fossil Fete birthday package. No coolers are permitted in the park. Cakes and food are not permitted for the Cretaceous Celebration package. Gifts and food must be brought to your car once the party is over. Field Station: Dinosaurs is not responsible for lost or stolen items.